When your breath makes a reed vibrate on the harmonica, some of the air escapes along the space between the edge of the reed and the edge of the slot in the reedplate. You can narrow this space so that less air escapes. This narrowing allows the reed to respond more efficiently and with increased volume. You narrow a slot by pressing the edges of the slot inward with a hard object. Harmonica players call this embossing. You can emboss a slot with a rounded object that’s harder than the reedplate metal; has a smooth, regular surface without sharp edges; and has a diameter that’s larger than the width of the slot. For example, you may use a coin, a socket from a socket wrench, or even the knob on the end of a tuning fork. When embossing a slot, you start at the tip end of the reed. There, press firmly but lightly and pull the embossing tool back along the slot. When you press on the slot, you’re also pressing the reed down into the slot, and that pressure may lower the height setting of the reed. To avoid lowering the reed setting, stop about two-thirds of the way along the reed for longer reeds. With very short reeds, you may be able to emboss only a short portion of the slot length without displacing the reed. 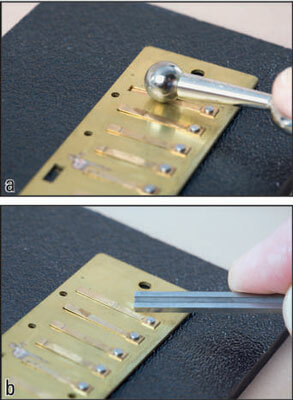 Too much pressure when embossing makes the slot touch the edge of the reed and prevents the reed from vibrating. So always emboss one stroke and then plink the reed to make sure it can still vibrate freely. If you emboss too much and cause reed obstruction, try plinking the reed several times to clear the obstruction. If that doesn’t work, use a shim like you would to clear obstructions or lightly drag the edge of a screwdriver or knife blade against the edge of the slot until the reed can move freely again. To emboss close to the base of the reed without mashing the reed down into the slot, you can try using a sharp blade. (You can also get a specialized tool for this from harmonica manufacturer Seydel or from tool builder Richard Sleigh.) Press the corner edge downward and inward against the edge of the slot and run the corner of the blade along the edge of the slot. Be careful not to score the edge of the reed or shift the reed out of alignment. If you have a reed wrench from a manufacturer’s tool kit, you also can pivot the reed away from the slot, emboss the entire length of the slot, and then swing the reed back into place. Do this only if you have the patience and the motor skill to realign the reed.